`What is it' asks Tom Wolfe, `that makes a man willing to sit on top of an enormous Roman Candle...and wait for someone to light the fuse?' Arrogance? Stupidity? Bravery? Courage? Or, simply, that quality we call 'the right stuff'? A monument to the men who battled to beat the Russians into space, The Right Stuff is a voyage into the mythology of the American space program, and a dizzying dive into the sweat, fear, beauty and danger of being on the white-hot edge of history in the making. The men had it. Yeager. Conrad. Grissom. Glenn. Heroes ... the first Americans in space ... battling the Russians for control of the heavens ... putting their lives on the line. The women had it. While Mr. Wonderful was aloft, it tore your heart out that the Hero's Wife, down on the ground, had to perform with the whole world watching ... the TV Press Conference: "What's in your heart? Do you feel with him while he's in orbit?" The Right Stuff. It's the quality beyond bravery, beyond courage. It's men like Chuck Yeager, the greatest test pilot of all and the fastest man on earth. Pete Conrad, who almost laughed himself out of the running. Gus Grissom, who almost lost it when his capsule sank. John Glenn, the only space traveler whose apple-pie image wasn't a lie. "It is Tom Wolfe at his very best...technically accurate, learned, cheeky, risky, touching, tough, compassionate, nostalgic, worshipful, jingoistic... 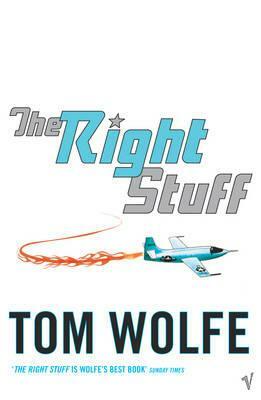 The Right Stuff is superb"
Tom Wolfe (1930-2018) was the author of more than a dozen books, among them The Electric Kool-Aid Acid Test, The Right Stuff, The Bonfire of the Vanities, A Man in Full, I Am Charlotte Simmons and Back to Blood. He received the National Book Foundation's 2010 Medal for Distinguished Contribution to American Letters.